Comments, posts and images from Club Track events. Back at Portsmouth, this time for the Hampshire Schools T&F Championships. 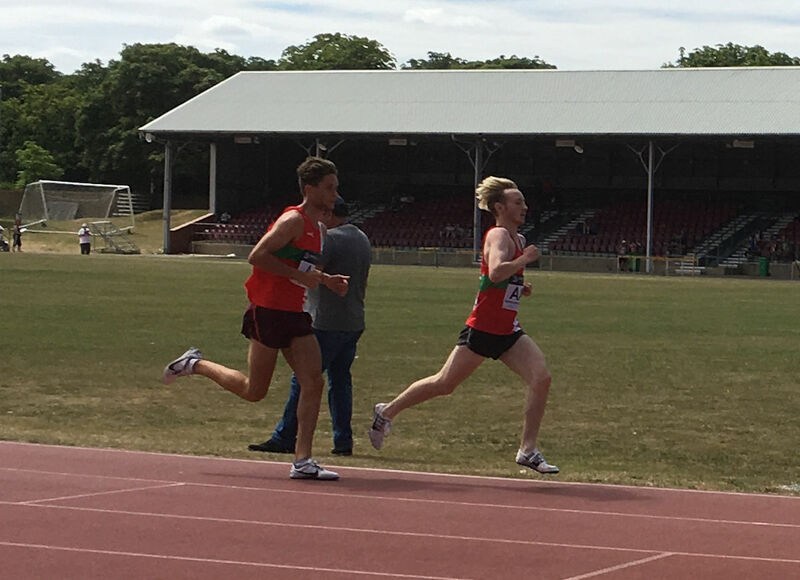 Robbie was very positive going in to the 3000m, with the main competition coming from Lachlan Wellington, both having run similar PB’s to date. Ultimately the race was combined with the older (6th form) age group leading to Robbie’s AFD team mate Jake Cvetkovic running on the track at the same time. For a long time Jake led tha pack, which quite quickly slimmed down from about 12 runners to 3, with Jake pushing the group forward, Robbie sat in second and Lachlan keeping in nice andf tight in 3rd place. This continued for a number of laps until Jake started to push, as the pace stepped up, Lachlan slipped past Robbie and a look of pain was plastered to Robbie’s face… From this point on the gap between Lachlan and Robbie just continued to incrase, with Robbie finishing the race some 30 seconds slower than his worst run to date. When asked what happened, Robbie decalred that his foot was really hurting. Turns out he has a stress fracture in his right foot, and will now be out of training and competitive running for at least 8 to 10 weeks, so it looks like the summer T&F season is well and truly over. Hopefully once sorted he will be able to start building his fitness back up ready to be competitive in the upcoming Winter season. Robbie still finished 2nd in his age group, taking the County Championships Silver Medal. Robbie gritting his teeth as pain flairs in his foot with 2 laps to go. Another drive around the M25 to glorious Watford and another open event. Robbie looking to put in a good PB tonight, and hopefully get the National Standard to confirm his place in the Hampshire Schools. 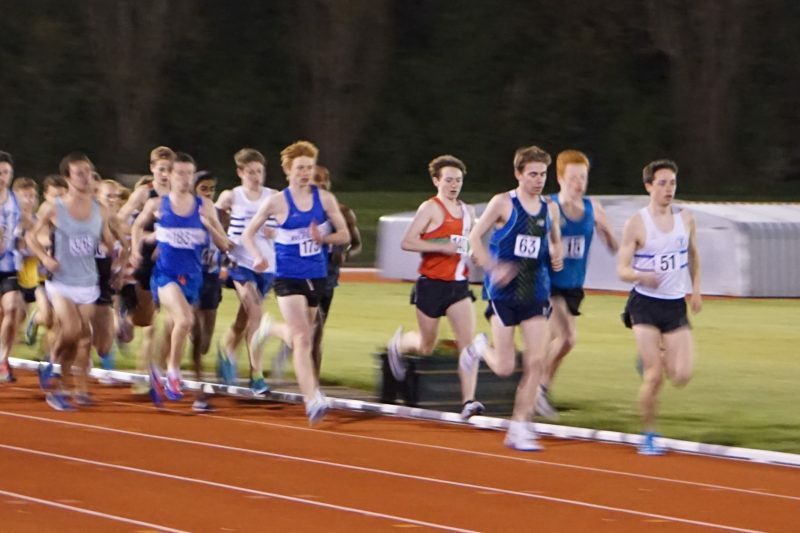 As always with Watford the 3000m is broken down in to various races, on this occasion 10, Robbie is running in the 2nd to last race (they get faster throughout the night) with a race target of 8:40, and a personal target of 8:50 a bit of a push from his current PB of 8:59. The race runs well, with Robbie running a steady 70″/71″ per lap pace which is spot on for an 8:50 time, but as things push out his times slow of the pace slightly and he drops down to a couple of laps at 74″ and obviously struggling with the pace for the last lap only manages a time of 8:56.8. Not the 8:50 he hoped for but still a good 3 seconds better than his PB, so can’t complain. 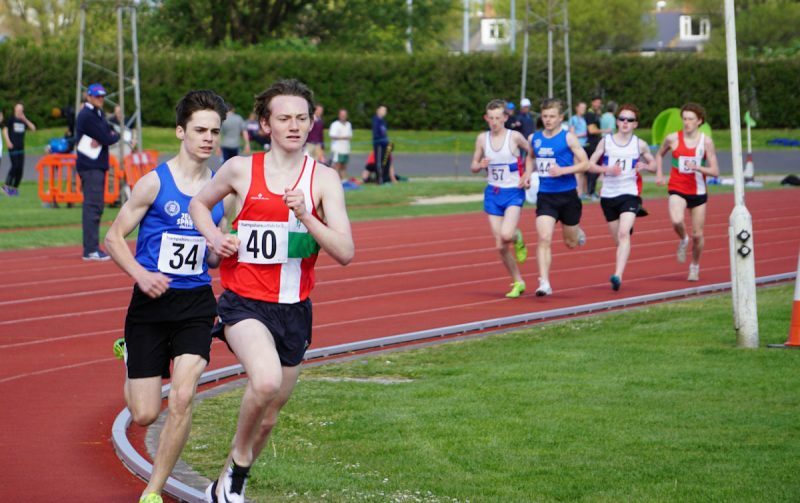 A few more of these events and a few more 3″ of his PB and he will be well on his way to Schools and competing well at the National 3000m. Robbie sitting in and waiting for his time. Thes econd YDL of the season is a home track event for Robbie, running once again stepping up and age category to run in the U20 Mens B race. Athletes from all 4 U17/U20 raceswere lined up to compete in one single event, specific race positions extracted from the final positions and times. Robbie started off fast, taking the race on for the first 400m at which point Aldershot team mate Nathan Gibson stepped to the fore and pushed the race on, the weather was, as seems to often be the case, a little blustery and it had an obvious impact on the runners coming down the back straight, that said Nathan kept a good pace, with Robbie sat right on his shoulder, and Bedford’s Ryan Ward sat on Robbie’s. With about 200m to go Ryan pushed out the boat, passing Robbie, and then Nathan and ultimately taking the U20 A race win, with Nathan 2nd. Robbie finished 3rd overall, 1st in the U20 B race in which he was actually competing. So another good YDL result promising an excellent YDL season for Robbie in his first year competing at U20. (Even though he is still U17). Robbie leading the pack for the first lap. 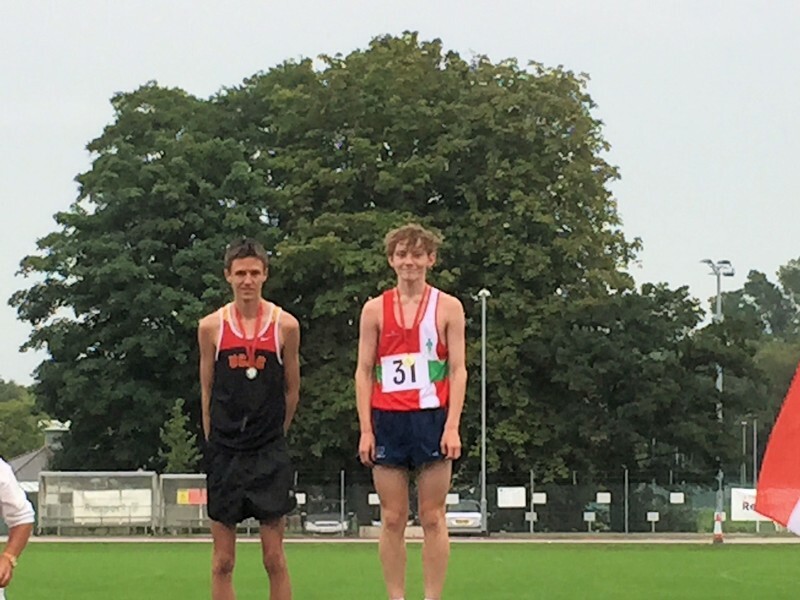 Another 2 event Championships for Robbie, medals expected in both the 3000m (Saturday) and the 1500m (Sunday) with a chance at gold in either of both events. The big rivals for the weekend being Zac Mahamed and Lachlan Wellington, on the weekend though Lachlan was out with a sickness bug, and Zac only entered the 3ooom which left Robbie with high hopes for a gold in the 1500m. 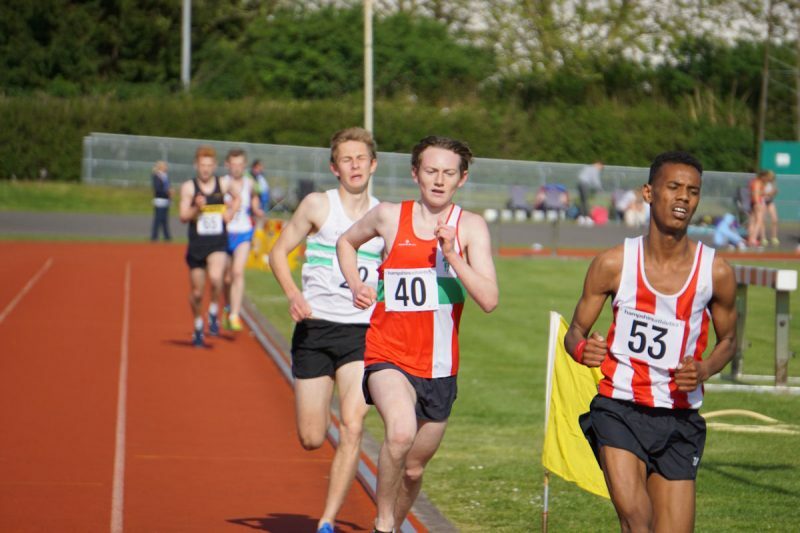 The 3000m was a combined race, both the U20’s and the U17 running in a single event, the U20’s went out and immediately slowed the race to what amounted to a painfully slow pace, with Robbie’s preferred style being a consistent pace, this really didn’t help him at all, a fact that was highlighted in the middle third of the race when the U20’s decided to push the pace, and the only U17 willing to push that early was Zac Mahamed, there were signs of Robbie closing the gap toward the end of the race but Zac’s lead from that middle section was far to great to close. A great run from Robbie, but a great race from Zac saw Robbie taking silver in the 3000m with Zac taking Gold and Kier Sullivan taking bronze. The 1500m was short manned enough to run it as a single race, so no heats to deal with, and no U20’s to add tactics to the mix. Robbie took the race on from the start, and it was fairly obvious that Jersey runner William Brown was happy to let Robbie blast the pace and sit on his shoulder, in a windy Portsmouth stadium William took the benefit of that powerful wind on his back down the back straight, with Robbie taking the brunt of the wind in his face on the finishing straight. A situation that gave all the advantages to Will, and made everything hard for Robbie, highlighted by the blast of speed that Will delivered in the last 300m to take Gold from Robbie’s silver and Jacob O’ Hara’s bronze. A great run from all 3 lads, and some excellent tactics from Will. Robbie Taking on the race with Will Brown sitting in tight on his shoulder. Well done to everyone who competed over the weekend it was another great event, with some exceptional performances. 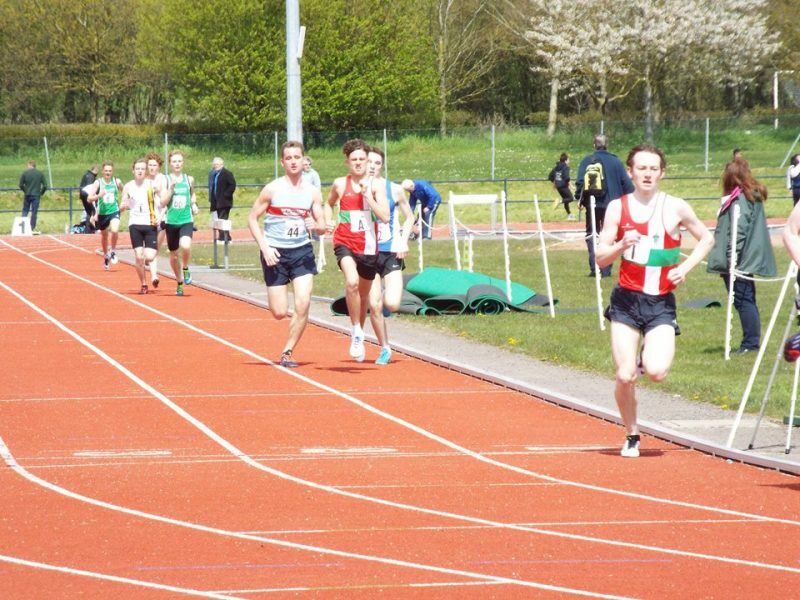 Robbie Coupland running the YDL 1500m at Horspath track in Oxford, representing AFD U20 men. After being boxed in for the first two laps and constrained by a stiff breeze, Robbie still managed to achieve a personal best of 4:15.9 Well done Robbie! Well, thwe first run never happened, apparently as an Under 17 you can run 5000m races, but you can’t run 5000m races if they include anyone older than yourself. The 1500 doesn’t have this rule but was already full from an AFD perspective, so no run for Robbie. 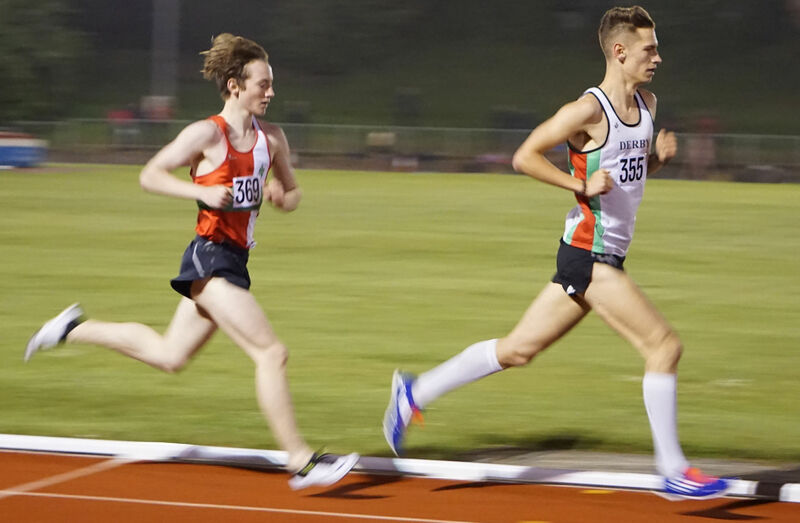 So last night April 20th presented Robbie with his first track event of the season, a 3000m open at Watford Harriers home stadium and a late night was to follow, we got home about 11:45pm. The race itself though went very well, three heats were created with runner in heat 1 aiming for times sub 8:40, heat 2 between 8:40 and 9:40 and heat 3 for runners expecting to be slower than 9:40. A few AFD team mates were there on the day, some running 800 and some running the 3k along with familiar age group runners such as Sam Crick. From the start Robbie was keen to keep with the leading runners, although 8:40 would be too fast for him, the pace wasn’t quite that hot anyway, and the first 200 (Robbie’s target 35 seconds) was hit in 36 seconds from there the 1 second out approach seemed to manifest itself in most laps the next 400 being run in 72 seconds (Robbie’s target 71 second laps) followed by 72,71,71 and just as things were getting on track a couple of laps saw Robbie forced a little wide on the bends and came in at 73 and 73 which still put Robbie on target for his PB (just) but would not put him sub 9 mins nor would it get the English Schools Qualifying time of 8:59:00. Robbie stepped up the pace as the bell rang running the last lap in 68 seconds with all the little bits added on the total time came in at 8:59:02 so a good 6 second PB but 200th of a second of the English Schools Qualifying standard. All said though a great, if cold night, extended by some naming problems on the score cards, but we are sure they will get sorted soon enough. Last years 3000m (U15) event saw a very special race with 5 of the top 6 runners getting PB’s and the results aligning exactly with the Power of 10’s rankings, mostly because the times set became the runners ranks. Robbie came 6th last year, as bottom age group he wasn’t expecting such a high finish this time round, but also wasn’t expecting quite such a disappointing run. The race started very fast, Robbie trying hard to settle down at his own pace still clocked up a fast 67 seconds first 400m whilst sitting at the back. As other runners started to slow Robbie stepped up and start picking off the runners in front of him until he found that the next runner was too far away to have a chance of catching. So, much like the Hampshire Grand Prix, Robbie found himself alone and with nobody to help drag him round, ultimately finishing in a disappointing 20th place in a time 11 seconds slower than his PB. We had hoped that this very competitive race would enable Robbie to improve his PB for the 3000m but it simply wasn’t to be. So the track season target of sub 9 minutes for 3000m never happened, and nor did the sub 4’05” 1500m. 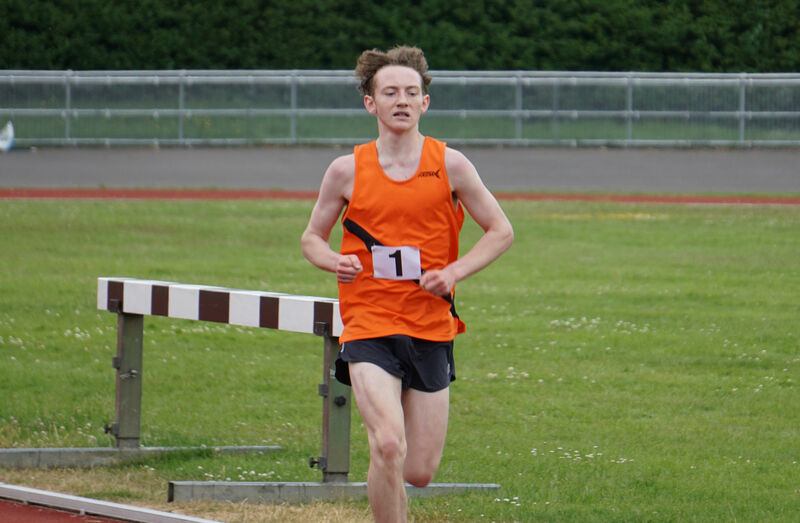 Track season is now over for Robbie, Road Relays around the corner followed by Cross Country. We hope that the 2015/16 season treats him better than last year. John Hewitt Memorial – AFD Junior Championships. The only in-club event of the track season targets the junior sections, from Quad kids through u13, U15 and up to U17. Many of the events for the older age groups were a little light on entries this year, partially caused by the date clash with the U15/U17 National Championships. 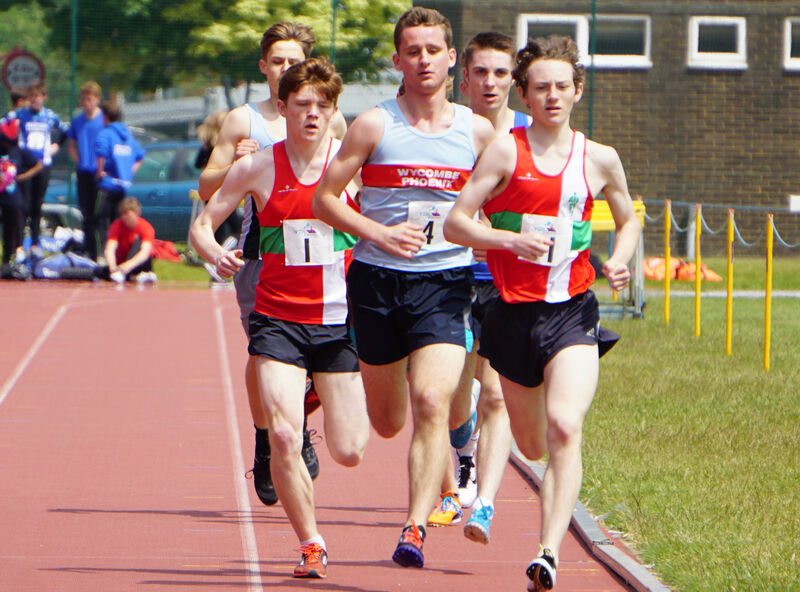 The 1500m was run as a single event for U15/U17 and both sexes. With Robbie running the 3000m at the National on Sunday, this was supposed to be a gentle run out to warm up the legs, only nobody told the other runners that. 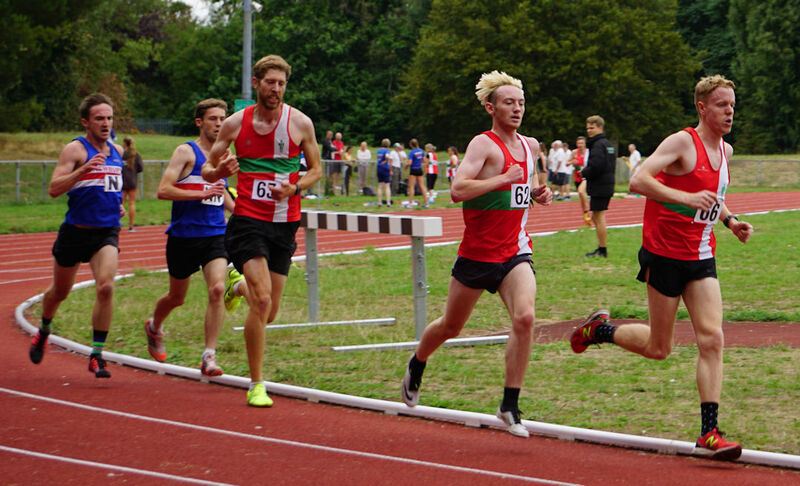 New boy Alex took on the charge and pushed out the pace from the start, though not exceptionally fast, it was still faster than initially expected, fortunately by the 600m point the pace settled, and Robbie slipped past and ran his own race finishing first in 4:22:00. A good run out and nice to see some new faces on the track.